Emissions testing one of Australia's cleanest cars. The sticker initials on the back of the Honda Odyssey read 'LEV' - low emissions vehicle. But is it really? And how well does it continue to perform when the engine management has a few defective input sensors? We put the Odyssey to the (low emissions) test - the results are just bloody fascinating! Last week we introduced Bell's Auto Service's I/M 240 emissions test equipment. Using the same drive cycle software and dyno as the US in-service smog test, it allows the very accurate analysis of the emissions of a car to be made by undertaking a precise, repeatable test. Unlike most workshop gas analyses, the equipment records data in terms of the mass per distance travelled (ie grams per mile). As you'd expect, it is therefore very good at seeing how much total pollution a vehicle produces. Honda has been a leading exponent of emissions reduction technology for decades - its CVCC combustion chamber design was an early breakthrough on Civics bound for tough emissions markets. The company has continued to stay at the forefront of low emissions vehicles and, while it is not required in Australia, has decided to sell here a range of cars that have Low Emissions Vehicle (LEV) status. Honda's PR states that these cars have emissions that "not only satisfies 2000 emission standards, it meets Japan's stringent J-LEV standards that require 50 per cent reductions in HC and NOx emissions relative to year 2000 Japanese standards or 80 per cent less than Australian standards". The 3-litre VTEC V6 used in the up-spec Odyssey develops 154kW at 5800 rpm (for those into historical perspectives, that's more power than a VL Commodore Turbo!) and impressed us for its smooth and strong torque. In this regard, the on-road performance of the car was helped by its considerably intelligent 5-speed automatic transmission. 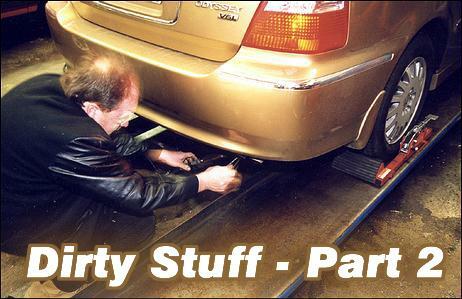 The only gearbox available with the car, the trans may well be an important ingredient in the car's LEV status. 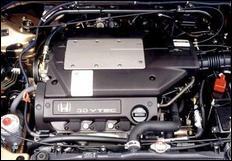 Information from Honda suggests that a larger-than-usual cat converter and very precise engine management control are the other techniques used to control emissions outputs. Additionally - though not stated by Honda - we'd expect factors such as combustion chamber shape, injector design and placement, exhaust design and other similar factors to be very important to the overall emissions reduction strategy. From a driving perspective, there appear to be no downsides to the LEV badge - the days of cars being strangled by emissions gear are well and truly passed. But how good are the car's emissions? It's one thing to make claims; it's another to live up to those specs. 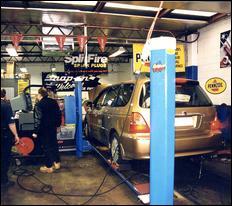 The Odyssey was placed on the emissions test dyno and the engine and driveline were warmed up. Notable during this process was how stable the FWD car was on the rollers - as one onlooker commented, it's one of the most docile front-wheel-drives you'll ever see being dyno'd. 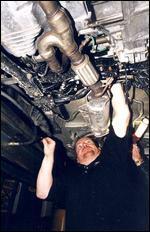 Once the engine was warmed, one of the direct-fire ignition coils was removed and then linked to its plug with a short length of spark plug lead. 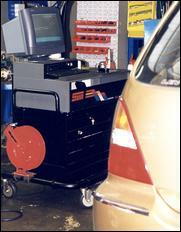 This allowed the easy sensing by the test software of engine rpm, using an inductive pick-up placed on the exposed lead. The gas analyser was zero'd, then the test could begin. AutoSpeed contributor Graham Pring 'drove' the car through the test cycle; the ease with which the transmission dropped down ratios made it hard for him to maintain the required speeds at all times. This was indicated by the car symbol on the PC screen changing to red when he strayed from the 'road' that is required to be followed. (For more on the test techniques, see last week's article). 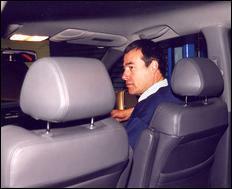 However, at least in all of the tests he was consistently bad in his driving! Two hundred and forty seconds later, the emissions results of the Odyssey could be examined. The first PC screen that is shown is a quick-view pass/fail display - not unexpectedly, the Odyssey passed in all areas. But it was when the numerical results were examined that we could see just how fantastically good it is. The following table shows the results. First up, the HC (hydrocarbons) were unmeasurably low. Like, in terms of grams per mile over the test cycle - zero. The carbon monoxide (CO) was just 0.42 per cent of what is allowed - or if you like, 99.58 per cent lower than required! The NO (nitric oxide) didn't do as well - it was 'only' 94 per cent lower than legal! These results are simply staggering. 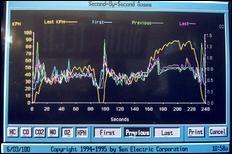 When the step-by-step gas graphs are examined, it can be seen that nearly all of the HC were produced in the initial acceleration off the line - after that, the HC line is stuck at zero. The CO graph line shows the tiniest of blips at 140 seconds into the test - but otherwise it, too, is generally immeasurably low. However, the last of the noxious gases - NO - does have some graph movement. 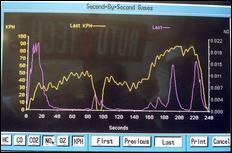 As shown here (pink line), at all points within the drive-cycle where major acceleration or deceleration occurred, the NO spiked - plus there were a few other spikes as well. However, as the emissions test handbook points out, short duration spikes aren't all that important to the overall test results - it's the area under the curve which matters. And there wasn't much of that. It appears that when the oxygen sensors are disconnected, the management runs the engine richer in parts of the cycle than normal - explaining the slightly worsened fuel economy. However, even without the oxygen sensors working, the worst gas (NO) was still only 25 per cent of that allowed under this test! HC remained 96 per cent lower than required! After we saw these results we sat back. Hmmmm - what fault condition could we now simulate? We disconnected the throttle position sensor, the coolant temperature sensor and the canister purge valve connection. The oxygen sensors remained disconnected - so this engine was now a sick puppy indeed! An absolute credit to Honda's engineering, the engine still started and ran nearly normally, betrayed only by an idle speed that hunted when the car was out of gear, and automatic gear changes that occurred harshly at much higher rpm. Even with all of those sensors disconnected, and despite the fact that the changed shift points of the auto meaning that the car did the test at much higher revs, the Odyssey only just failed the test. CO exceeded the limit by 23 per cent while the other gases were still quite legal. Fuel consumption rocketed by over 75 per cent and the cat converter was working overtime - evidenced by the large amount of water being generated in the exhaust. However, the fact that the car could even be close to the I/M240 standard in this degraded state of tune is quite astonishing. Bell Auto is happy to do one-off emissions tests for a quite low charge.